I have been getting on quite nicely with my week of misery regime recently. It goes like this – in the week I am veggie wherever possible and I also avoid dairy. James has met me half way with the dairy thing but he draws the line at being veggie so at the weekend carnivorous activity is resumed (sorry veggie and vegan friends). He had to go into work today – Sunday is one of two precious days off for him ordinarily, but not today alas. And so I wanted to cook something nice for our dinner but something that wasn’t Sunday-lunch-ish considering he’s served up in excess of 200 of those bad boys today. And so I settled on Roast Gammon. It is one of those things I just never thought to cook before Christmas 2012, when it was suggested to me as an alternative Boxing Day lunch, served with roast new potatoes and Winter Slaw. And, minus the roast pots, that was exactly what I had a crack at today, albeit without a specific recipe because I thought I’d wing it. It was a TRIUMPH! I can’t tell you how surprised I am! I am an avid recipe follower you see, and even then I generally balls it up. My food is occasionally tasty, but usually only about edible, and I am far too afraid to ever go off piste without a recipe. Who knows why I did today, but it worked a treat and so I hope you don’t mind me capturing it for posterity on here even though I know I have totally overdone it with the mindless prattle this week. Sian’s Cobbled Together Alternative Sunday Dinner. Buy some smoked gammon. I bought a 750g chunk. Chuck it in a bowl. Chuck your gammon in on top and roll it round until it’s coated. Then cover the bowl, bang it in the fridge, and go wake your toddler from his nap. When you’re ready to cook it, shove a slow cooker on high heat, let it get nice and toasty and then throw in the gammon plus marinade and slug a load of cider on top. I used a 750ml bottle of Sainsburys Medium Dry cider for this. Speak in piss poor Somerset accent and laugh at yourself because you are a moron. Bang the lid on and let it do its thing for an hour and a half or so. Whack the oven on 180. Elegantly transfer said gammon into a roasting bag with a few ladles of the cider sauce and let it cook for an hour. In this time, you could put your toddler to bed, or do a spot of reading, or paint your toenails, or fanny about with an exercise video. Hell, you could be a right swot and prepare your Slaw in advance. The choice is yours. After the hour is up, turn the over down to 150, snip open roasting bag, pour away the juices and transfer the gammon onto a roasting tray. Find the nice marmalade again and spread a dollop onto the fatty top bit of the gammon. If, like me, your gammon is drunk from all the booze you have thrown at it, and keeps toppling over onto its side DOOF then spread some marmalade on the side too. Just not loads. Sling back in the oven for a further 15 mins. At this point, if you are totally paranoid like me and have one, use a probe to check the middle of your meat is cooked to 65 degrees or more. If not, cut into it and check it’s cooked through. 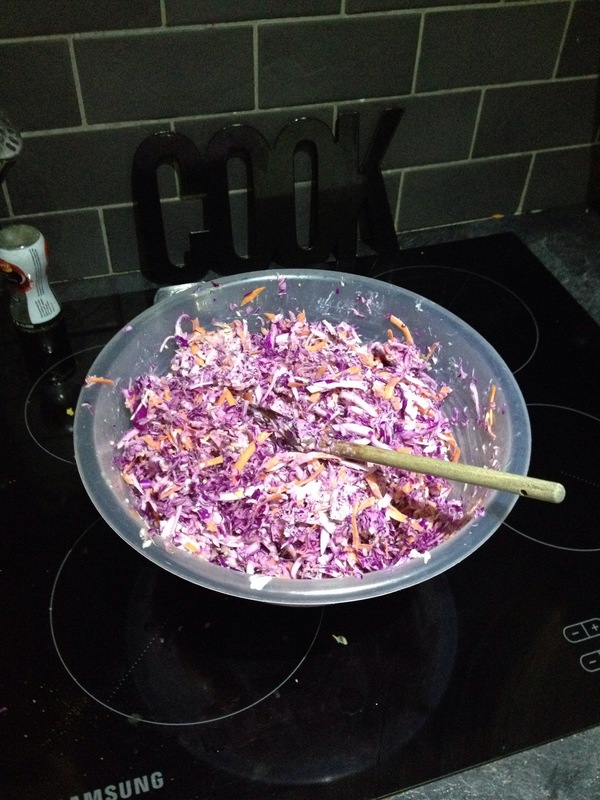 CAVEAT This is a good old Jamie Oliver rehash – if you Google Winter Slaw you will find his recipe. I have made it lots of times, so didn’t bother with the recipe, just made it up LIKE A MAVERICK BADASS. Chop up some red cabbage. Chop up some plain old white cabbage. Chuck in a bowl THWACK. Squeeze the juice of a lemon over it to stop it discolouring. Mix 1 tsp of grainy mustard, half a tsp of English mustard, with about 8 dessert spoons of natural yoghurt and the juice of two lemons. Season. At James’ suggestion I added in a shakey shake of dill and one of celery salt. Stir through your grated veggies. For extra fun, go at it with gusto and fling a good amount all over your surfaces and floor. End with a gigantic bowl of coleslaw that will keep you going for a clear week, like the one below. Wimp out of plating it up entirely and leave that to your Chef husband. We ate this with some Sourdough, and I thought it was delicious.